I have decided I absolutely love skittle manis. I've done a lot lately. I can't get enough. 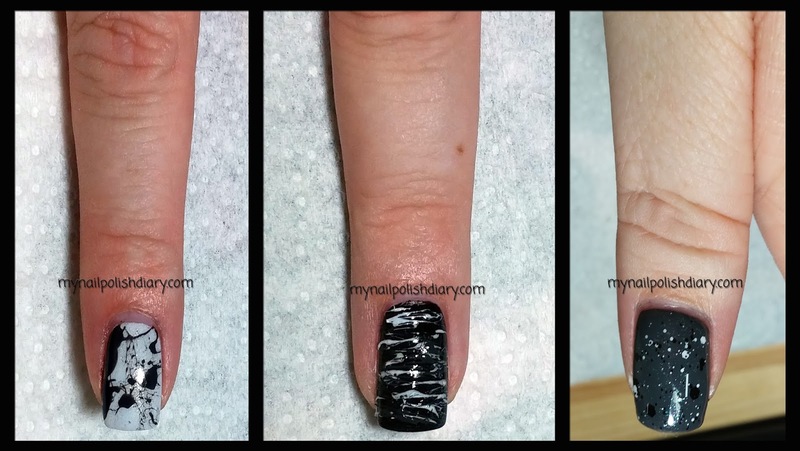 Plus it helps when trying to whittle down those untrieds ;D For this mani I decided on a monochrome theme. I have been thinking about this one for about a week now and planning it in my head. I don't always do that with nail art but this one was just all in my head and I couldn't wait to get it on my nails. I decided on today because it's a great day today! It's DH's birthday. We're celebrating at Ruth's Chris for dinner tonight and we can't wait. We love eating there. It's not somewhere we go a lot though. It's pretty pricey. But super delicious and the perfect place to celebrate. This mani took a long time for me to do. I have never done a sugar spun effect nor have I done the splatter effect. I had good luck though and I think they turned out nice. But it was a little slow going since I hadn't done it before and I was figuring out as I went along. I really love how this turned out! I am positive I will be doing the splatter effect again. I'm pretty sure I will do the sugar spun too even thought it's pretty tricky and takes a while to do. It's lumpy too! 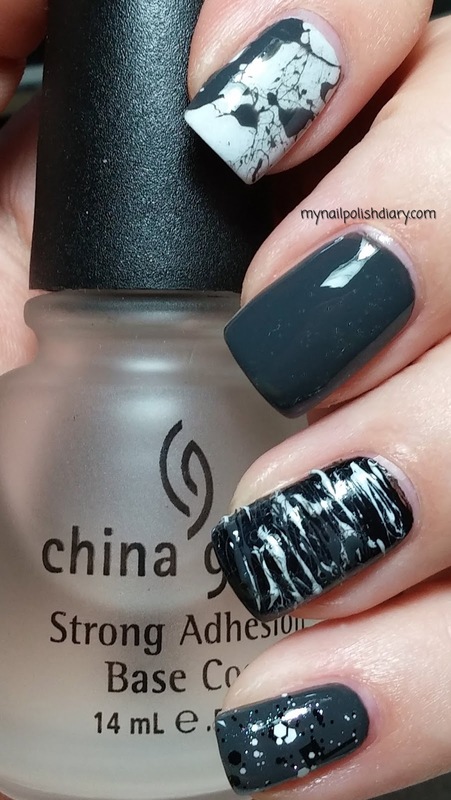 China Glaze Concrete Catwalk was really runny so I had to be careful applying, but it looks beautiful. China Glaze Liquid Leather is also runny, but I was prepared for it since I've used it quite a few times before. Bonita Dying To Party took 3 coats and still had some streaks. The formula was not great! It dried really quickly so I had to apply quick. I wasn't surprised when it dried matte because of how quickly it was drying as I applied though it doesn't say it's matte on the bottle and I didn't notice it on the display either. The silver shimmer was almost unnoticeable until I applied top coat, then it kind of pops. I like this color in spite of it's finicky formula and will definitely be using it again. It almost looks white but it's not as stark as white looks on my nails. I love that!